When one car hits the back of another to cause a rear-end collision, it is often called a “rear-ender.” These types of accidents happen at slow speeds and fast speeds alike. Seat belts and airbags often provide protection for motorists in a rear-ender. For motorcyclists, rear-end collisions have an entirely different set of risks and can often be one of the most devastating types of collisions. Whether a motorcyclist is in the front or back of a rear-end crash, devastating injuries can result. When a motorcyclist is the front vehicle and is hit from behind, the back of the motorcycle is often sent upward, throwing the motorcyclist forward off the bike toward the ground. This can cause serious injuries to the head, face, jaw, and teeth – even if the motorcyclist is wearing a helmet. If the motorcyclist reacts by putting their arms out, they can sustain broken or shattered bones. On the other hand, if a motorcyclist suddenly hits the back of a car, the sudden halt in momentum can throw them off the bike onto the car. Many people may bounce off the car and land on the ground, causing multiple points of impact and multiple traumatic injuries. These can include spinal cord injuries,1 neck and back injuries, broken bones, and more. 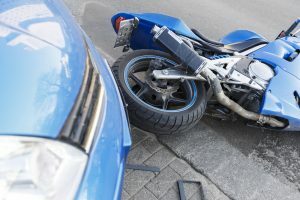 When another driver causes you serious injuries, you need an experienced St. Louis motorcycle accident attorney on your side as soon as possible. At Page Law, we will evaluate your case and help you hold any possible party liable for your medical bills and other losses. Please do not hesitate to call our office at (314) 322-8515 for help.